Conceived in 2003, KTZ is a contemporary London-based fashion label under the creative direction of Marjan Pejoski and management of Sasko Bezovski. In 1996 the pair opened the shop Kokon to Zai in Soho as a hybrid music and fashion store, which became a platform for creative projects, showcased cutting edge designers and produced the label KTZ. KTZ designs men’s and women’s ready-to-wear clothing with couture detailing known for its raw energy and contemporary urban edge, but also for embracing ethnographic references and multiculturalism. The KTZ label creates a dynamic combination of contrasting elements: modernity and the ancestral, the secular and the religious, anarchy and severity, spectacle and depth. This makes a unique label identity that is recognized widely and is worn by pioneering personalities in other creative industries, in art and music. 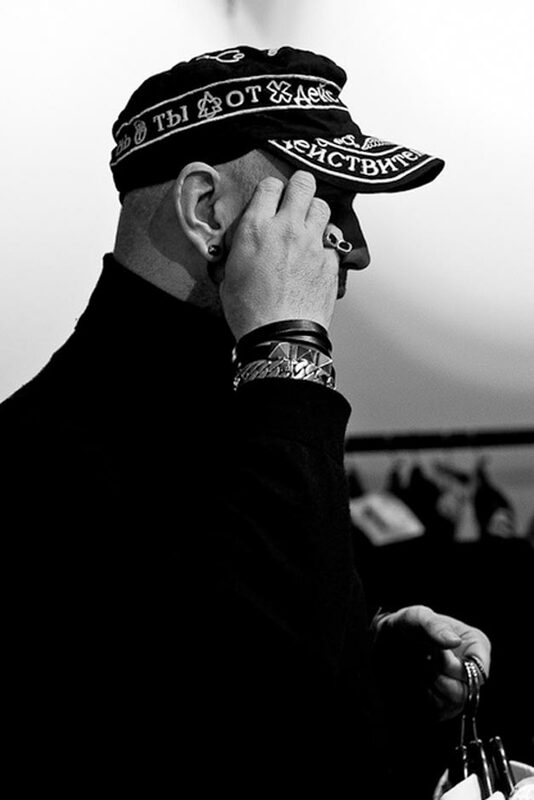 KTZ operates two flagship stores in London and Paris, and receives international exposure. Marjan Pejoski has been operating his own label since 2000, gaining both national and international acclaim. Pejoski’s unique style, coupled with his appreciation for high quality, has produced garments that have become a huge commercial success. Pejoski’s design philosophy encourages pieces that stand out, look individual, and continually inspire the imagination of those who both see and wear them. Merging traditional techniques and materials with his visionary appliqué methods, Pejoski’s concepts are truly innovative, merging old with new, past with future, and hard rock with romance. Marjan Pejoski’s works constantly surprise through their mix of themes and wide spectrum each season. The result is 4 collections a year that are stylishly progressive, enduring, and versatile. The “Marjan Pejoski Design” thrives on counterpoint and dichotomy; it is romantic and poetic, yet hard and challenging; innocent, yet sinful; androgynous, yet dandyesque. Due to the recognizable unique design, numerous press releases, famous buyers, and celebrities, the brand has achieved a cult status at some of the most reputable, cutting edge stores and boutiques worldwide. The brand has made a name for itself in the highly selective and competitive pret-a-porter market. Marjan Pejoski designs garments for those who are not afraid of expressing themselves. He creates a clothing language that allows the customer an additional possibility to display their individuality. This customer doesn’t belong to a certain class or specific age-group. Most of them have a creative background; they are graphic designers, photographers, stylists, professional models, actors, art or design students, musicians etc. These clothes are dedicated to the customer who loves and enjoys exploring life with all its rich diversities.